Continuing with the education of ten more entomology related terms. Most of the terms are related to termites, but there are a few tangents to other pest. Media [ me-D-ah ] n.
When one thinks of “media,” one will immediately think about a television. Within the entomology world, media is related to the one of the major wings veins. The lines that are visible on any insect’s wings are viens. One of those veins is responsible to flow the blood throughout the entire wing, the media wing. Membranous wings [ mem-brain-us wings ] n.
While we are on the topic of wings, membranous is the term to describe the thin, partly transparent wings of insects. A few insects that have membranous wings are bees, flies, dragonflies, ants, termites, beetles, mosquitos and so one. Not every bee has membranous wings, there are certain species of bees that don’t have transparents wings. Same concept goes to the other insects. Metamorphosis [ metah-mor-fo-sis ] n.
Metamorphosis is the change of body form that most pest go through. It starts from the egg through the adult stage. The quick reference to metamorphosis is the caterpillar to the butterfly. Other insects that go through metamorphosis are grasshoppers, beetles, moths, ants, termites and so on. The metamorphosis of termites starts with the egg, larvae (when hatched), nymph (toddler), reproductive (teenager/young adult) and then winged (full grown adult). This is the average cycle for each insect that goes through metamorphosis. Whenever you have a Arrowhead termite inspection on your home, the exterminator will study the termites and determine where they are in the metamorphosis stage. That will determine the termite control treatments in Arrowhead that is needed. If you do your own termite treatment, read the labels of the pesticide. The labels will indicate what exactly it will be targeting (eggs, larvae, nymph, winged). Moniliform [ mon-ill-ee-form ] adj. Moniliform is used to describe the antennae of termites. It means having beadlike, rounded, segments. Analyzing the antennae of the crawling and flying critter will determine if you have winged termites or flying ants. Both pest look alike. Studying the antennas is one of the methods to distinct them. Winged termites have straight and moniliform antennae, whereas flying ants have kinked and squared antennas. Nanitic [ nan-it-ik ] adj. Nanitic is an obscure term used to describe the undersize form of the first brood of a new colony. Basically, the born babies of the colony. Looking at ants, it’ll be easy to distinct the nanitic ants. There will be an enormous ant, and then tiny ones around it. The nanitic ants are tiny presumable due to the need to conserve nutrients. Nymph [ nimf ] n.
As you recall from the explanation of metamorphosis, nymph is a termite which has wing pads, but not mature wings. This termite is basically being introduced to puberty. Pathogen [ pa-tho-jen ] n.
Polycalic [ polly-K-lik ] adj. Polycalic is used to describe a distributed nest system. Analyzing a nest, termites, it would start in the central. From the central, the entomologist will be able to analyze the lifecycle of the colony. An exterminator will be able to determine when and how long the colony has been inhabiting in your home or outside on your backyard. Recruitment [ re-krute-meant ] n.
Shelter tube [ shell-tur tUb ] n.
Shelter tube are the tunnels that creates the galley. A fresh recall of a gallery is the design that termite create when they are eating away wood. The tunnels are referred to shelter tubes. Shelter tubes are made with soil, faeces, saliva and carton (gross!). These elements is what holds the tubes walls, creating an accessible path from A to B. There are many different kinds of termite species, other pest, and pathogens in each state. In Arizona, each critter and bacteria appear in your house based on the weather. Critters that are trying to escape the brutal heat will mostly likely hide in your home. The case can also be that critters are looking for a habitat to survive the winter. Desert pest and pathogens may appear anytime of the year. Having a termite or pest inspection on your property once a year will decrease the chance of any pest inhabiting in your home. 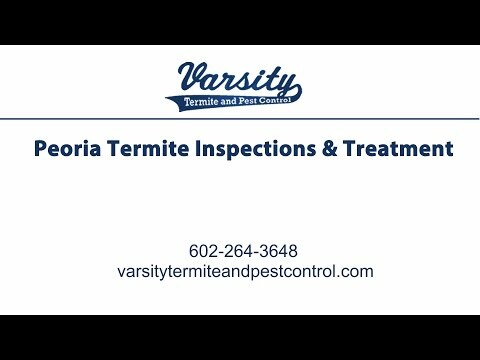 Call Varsity Termite and Pest Control to have an exterminator conduct an inspection. Our termite exterminators in Arrowhead are well trained and certified to handle any case.